This project examines how sorting criteria for recyclable household waste – paper, cardboard, plastic, metal, glass and food waste – can influence the quality of the collected waste, the collection efficiency and eventual recycling. The project aims to create a knowledgebase that state and municipal authorities can use in implementing the revised Waste Framework Directive; the drafting of a new national waste plan and the consequent municipal waste plans, work which will include streamlining and harmonising municipal waste collection systems. The EU’s revised Waste Framework Directive forms the background for this project. The revised Directive sets a target of 65% for preparing for reuse and recycling for municipal waste by 2035, while the Packaging and Packaging Waste Directive sets a target of 70% recycling of all packing by 2030. To achieve these targets a large share of the waste collected needs to be recycled. One of the initiatives of the government’s Strategy for a Circular Economy is to promote the harmonisation of sorting criteria for household waste. The initiative aims both to ensure environmentally better waste management and to ensure a sufficiently large, competitive and robust market to enable economies of scale. 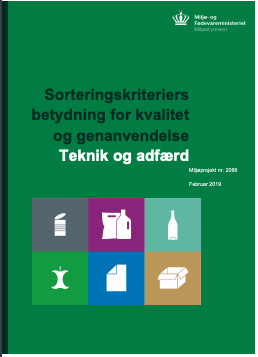 Dansk Affaldsforening (DAF) has mapped the sorting criteria used in municipal collection systems and produced recommendations regarding the harmonisation of sorting criteria for paper, cardboard, plastic, metal, glass and food waste. This report uses DAFs mapping to show where waste collection is currently harmonised across municipalities, and where sorting criteria differs across municipal boundaries. This project focuses on the differences between sorting criteria to support the necessary decisions in developing national standardised sorting criteria. This project addresses on two aspects of waste collection that influences the recycling rate: ‘technical aspects’ related the technical capability of sorting- and recycling facilities to work with the collected waste, and ‘behavioural aspects’ related to residents’ sorting behaviour. Both elements are essential to ensure more and higher-quality recycling of household waste. The goal is to reduce incorrect waste sorting at the household, while ensuring that the majority of the waste collected for recycling can be recycled.